While we're bringing up Amazon daily deals, today's is a good one: Broken Bells, the project between Brian Burton and James Mercer, aka Danger Mouse and The Shins frontman. It's really good. I had a link to their actual video, but I hated the singer's tight pants so much I didn't want any of you to have to see it. I've also been thinking about the recent suicide of Mark Linkous of Sparklehorse which has me kind of bummed. Holy crap, I had no idea. That has me pretty bummed, too. "I'd say I was joining the winning team, but that'd imply there existed a time when I wasn't on team evil." Like many people, I was introduced to The Sword by Guitar Hero II, on which their song Freya appeared (awesome track). I love their sound, but I do think their first album was better than their follow up (which is why I only bought 4 of the 10 songs from it). This talented band, like many others, became a victim of the grunge takeover of the early 90s. They disbanded in the mid-90s, but their CDs are still available from places such as Amazon and eBay. During their time, they were known for their exceptional songwriting and tight live performances, and I was lucky enough to see one of their concerts. Probably the most talented member of the band was drummer Shannon Larkin, who, after the band broke up, went on to play and record with several other bands. Since 2003, he has been the drummer of Godsmack. You can listen to many of the band's songs at Youtube (WA, SaZ). Here are a couple I've hand picked (that can be embedded). Each video has 1 or 2 NSFW words. Woah, that's pretty fracking awesome. I didn't know he was working on a solo album, but I like the sound of that track. He also has an album with his boyfriend (as Jonsi and Alex) called Riceboy Sleeps. Video is kinda strange, but the song is great. And the album is one of the best I bought last year. I would just like to take a moment to thank this thread for introducing me to Lovage. I've been listening to their album for the past few nights while playing Star Trek Online. Killing Borg has never felt sexier. Closing track from Hot Chip's new album. The chorus is so light and airy that it makes me feel all happy inside. A great song to coincide with the Spring Fever weather the East Coast has been enjoying the past couple days. Woo-woo! Another Lovage fan. That album rocks. You should check out Handsome Boy Modeling School's So How's Your Girl? and Dan the Automator's Wanna Buy a Monkey? for similar sounds. So How's Your Girl has some really good tracks, but feels a little 'flat' to me compared to other hip hop or his other work like Deltron 3030 and Dr. Octagonecologyst. He made a second album under the HBMS title, is it any good? The Replacement "Can't Hardly Wait" from the album "Tim" its a fantastic listen, & I'd recomend the extended version on Amazon. White People. I love it, but then it was my first foray into HBMS and I've had little experience with any others from Dan the Automator aside from Deltron 3030, so take that as you will. Second fiddle to Julian Casablancas in The Strokes. Judging by both artist's solo records, maybe Hammond should be first fiddle. Mumford and Sons - Little Lion Man. Amos Lee....good man...and a good mello sound... if you enjoy Nora Jones, you'll like this guy! 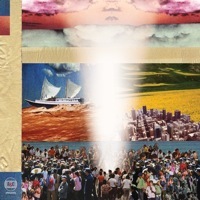 song is "Arms of a woman"
Anybody enjoying the new Broken Social Scene single World Sick? It's about time they came out with some new stuff. I just want to let everyone know, "Do not stop telling us about new music." I'm really digging the new Broken Bells album. It a collaboration between producer Danger Mouse and The Shins singer James Mercer. I've been hooked on the single for a couple weeks and now that the full album is finally out, I'm finding it to be quite solid from front to back. Ack! I just realized that this single is already linked, and on this page no less. Aaron, for whatever reason I missed this song the first time around. Thanks for posting it again — I loved it. And what a weirdly haunting video. It dropped in February, but B.o.B. 's "Nothin' on You" has "Summer 2010" written all over it in permanent marker.